Home » Can I Still Get Pregnant After a Fibroids Embolization? Share the post "Can I Still Get Pregnant After a Fibroids Embolization?" Many women put off treatment for fibroids because they don’t want to impede their ability to become pregnant in the future. While treatments for fibroids in the past had the potential for long-term effects on successful pregnancy, modern medical advances have made it possible to treat fibroids without causing a negative effect on a women’s future fertility. First, it is in your best interest to treat for fibroids. 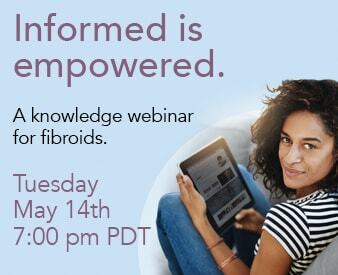 While many women experience mild or small fibroids with few obvious symptoms, fibroids can become worse over time, growing larger or multiplying, eventually causing the symptoms to worsen. If left untreated, fibroids can cause infertility. If a woman opts against treatment to preserve her fertility, she may end up suffering infertility due to the fibroids themselves. Historically, fibroids were treated with hysterectomies and myomectomies, both of these treatments affect fertility. Hysterectomies remove the entire uterus which makes it impossible to bear children and fertility issues are an associated risk of the myomectomy procedure. Even ablation therapy can cause some scarring to the uterus that can cause fertility issues. However, there is an option to treat fibroid with fibroid embolization. This treatment is administered through a minimally invasive catheterization procedure, which delivers an embolic agent to the uterine artery. This agent attacks the fibroids, causing them to shrink. As the fibroids shrink, the patient’s health improves and fertility can be maintained. Fibroid embolization does not involve a surgical procedure, which can cause scarring or other damage to the uterus that can affect fertility. Uterine Artery Embolization (UAE) is a non-invasive, non-surgical, out-patient procedure. It is performed under local anesthetic and sedation and has a very quick recovery time. Most patients are back at work in a few days. This quick treatment for fibroids is also very effective, with more than 90 percent of the women who have this treatment see their fibroids disappear or shrink to such small sizes that symptoms are no longer present. Other treatments can achieve similar effective results, but with much longer and more painful recoveries as well as risks to future fertility. If you have questions about fibroid embolization, contact the Fibroid Treatment Collective in Beverly Hills. The doctors at this practice pioneered this innovative treatment to provide a viable treatment option for women suffering from fibroids and the uncomfortable and inconvenient symptoms associated with the condition. The physicians and staff here know the treatment thoroughly and provide in-depth consultations to help women make the best choice for them to effectively treat their fibroids. The doctors will answer any questions about fibroid embolization as well as other treatment options so that each patient understands the procedures and her personal health. Don’t delay treatment for fibroids to preserve your fertility. This could backfire and there are safe effective treatment options that will preserve your ability to have a baby naturally.